I’m still wrestling with R and wishing I was a natural (or maybe just a more experienced) coder. Everything takes so long to work out and to actually do. Last time I shared the results, I was just looking at the top-line data that iSurvey shares. This time I’ve downloaded the data and sucked it into R, the command line based stats language. I start off looking at the basics. What is the size of my DataFrame (as it’s called in R)? I mentioned how the games compared in my earlier post. 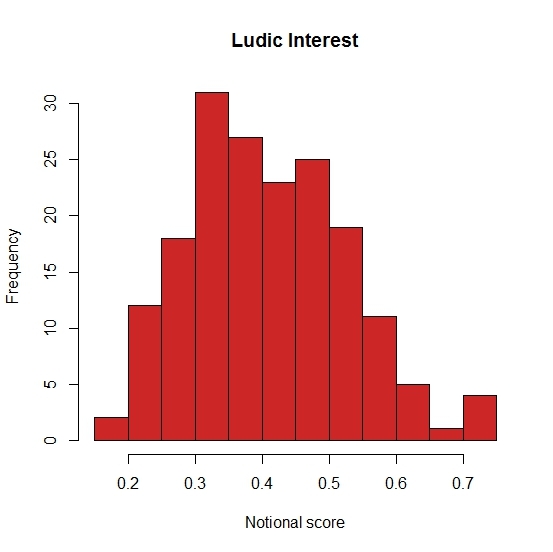 But since composing the survey I realized it should be quite easy to convert the categories into numbers and and total up individuals’ awareness of these games into a notional continuous numerical “game awareness score.” That might prove a statistically useful measure of a question I purposefully didn’t ask (which might have been: How interested in games are you? Not at all—–>Pro Gamer) against which I might be able to correlate certain play preferences, maybe even proving or disproving the oft-heard cry “Real gamers don’t play Angry Birds“! (An aside – I like this comic representation of a similar argument). Not entirely “normal” but getting there, with a positive skew, but nothing too dreadful. A set of data I can work with. Or can I? Because when I look at the values in the vector itself I find that a small number of values are coming up “NA”. Whats going on? It turns out that some respondents didn’t select any of the categories for some of the games. And if they miss out just one game, their Ludic Interest value is screwed. It’s not too bad for this vector, but I can only assume there are other questions, where other respondents have chosen not to select an answer. And I try to correlate those vectors with this one, more and more answers will come up “NA”. Hmmm, a bit more comb-like, almost bi-modal. Worrying. So, can I deal with the missing data in other ways, changing it to zero for example? 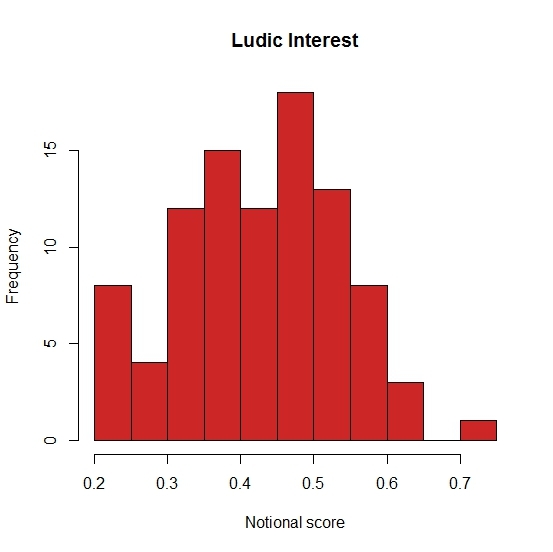 That might be (just about) acceptable for converting the categorical data in this particular question into a Ludic interest score, but may not be acceptable for the other instances of missing data. Ohhhhh maths is hard! Oh curse you, respondents! Why could you just have answered all the questions properly? And why didn’t iSurvey remove you when I asked it to strip out incomplete surveys? This post on Stack Exchange is the most useful introduction I’ve discovered so far about the mysteries of imputation. But I’ll leave that for another day. In the meantime, I’ll work with my 94 complete responses.